“I will always be grateful to you for the sacrifice you have made for the country. I promise that your son’s sacrifice will not go un-recognised,” writes Jitendra Singh Gurjar in one of his letters addressed to the family of Late Bhupendra Jaat, a soldier of the Indian Army who lost his life while fighting for the country. 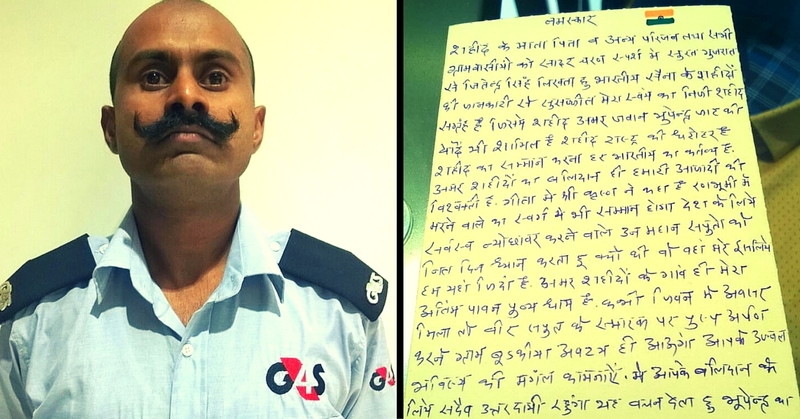 Jitendra, a 40-year-old security guard currently posted with a private firm in Surat, has written close to 3,000 such letters for nearly 20 years, on postcards addressed with love and respect, to numerous families across India. He had been writing these letters since the Kargil War. It is the duty to respect those martyrs who sacrifice their lives for us and we should fulfil our moral duties towards those families, he said. With this passion, he began collecting the contact details from the local newspapers and from different libraries and has collected details not less than 20000 martyrs. Jitendra also visited the families of many martyrs personally.